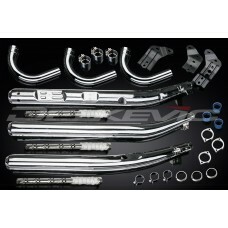 KAWASAKI KH750, 750H2, B, C (74-75) FULL MILD STEEL CHROMED EXHAUST SYSTEM. COMPLETE KIT EVERYTHING YOU NEED FOR THAT CLASSIC RESTORATION. DIRECT REPLICA MILD STEEL CHROMED SYSTEM. Delkevic now offer complete exhaust systems made to the same high standard and design criteria as our exhaust components. The attention to detail ensures fit and performance giving you a product that has proven to stand the test of time at an unbelievable price. The systems consist of the highest quality components. We manufacture all our own exhaust systems in our own factory employing the most stringent quality control procedures ensuring repeated customer satisfaction. All Delkevic complete exhaust systems have a 12-Month Guarantee.